The Historical Construction Equipment Association (HCEA) is a 501(c)3 non-profit organization dedicated to preserving for public education the history of the construction, dredging and surface mining equipment industries. THE 2019 INTERNATIONAL CONVENTION AND OLD EQUIPMENT EXPOSITION IS COMING! Featuring machinery built or powered by International Harvester! The HCEA is proud to announce a proposed new 20,000 square foot home for its National Construction Equipment Museum. Click here for the full story on this very important project and what you can do to help make it a reality. Please read the Instructions and Orientation to see what's here. If you are an HCEA Member, you already have an account or profile. You don't have to create one; in fact, we insist that you don't, because if you create your own you end up with two memberships. If you don't have a password, please click on [Forgot Password] in the Login window at the bottom of the menu at left. The software that runs the site will e-mail you a link that will let you choose a password. Please be advised that we need to have your e-mail address on file in order for you to access your profile. You can email it to us at info@hcea.net, and we will set you up. Welcome to our new and expanded website! You can learn about our organization and its activities, including our International Conventions and Old Equipment Expositions and the National Construction Equipment Museum and Archives. Our Forums offer venues for the buying and selling of equipment and parts, exchange of information and general discussion. You can also peruse Photo Galleries and hundreds of Links to websites pertaining to construction, mining and dredging history. Thanks to our Corporate Members and Media Partners! Corporate Members are businesses that have committed to support the HCEA through dues of $500 per year. Learn more about them and visit their websites on our Corporate Members page. Information on becoming a Corporate Member is available here. Media Partners are publishers and publications in the industry trade press who have committed to help publicize the HCEA through such means as donated advertising space, running press releases, and linking us to their websites. Learn more about them and visit their websites on our Media Partners page. To participate in this program, contact us. I know someone who’d like to receive Equipment Echoes, and I’d like to order him or her a gift membership. He or she does or does not live in the U. S. or Canada, or he or she is a student in the U.S.
HCEA Members enjoy a subscription to Equipment Echoes, our quarterly magazine covering the construction, dredging and surface mining equipment industries. Our Chapters form the backbone our our organization and serve to unite members locally. The HCEA’s 32nd Annual International Convention and Old Equipment Exposition was held at Ken Eder's Ederville 100+ Years of Progress show near Carthage, North Carolina, November 3rd through 5th. The show featured machines from Ken's incredible collection of over 1,000 tractors and many, many other kinds of machines and exhibits. Full coverage of the show was published in the Spring 2017 issue of our magazine, Equipment Echoes. Welcome to our newest Corporate Members! Established in 1958, Ritchie Brothers Auctioneers is the world's largest auctioneer of construction and mining machinery with forty permanent facilities in North America, Europe, the Middle East, Asia and Australia. Welcome, Ritchie Brothers Auctioneers, and thank you for your support! Visit our Corporate Membership page for more information on this program! The HCEA has launched a new line of custom scale models of historic construction equipment, and our first is as historic as they come: A 1/10 scale model of the Otis Steam Shovel, the machine that started it all in 1835. This is a limited-edition model, with only 70 being produced. It is available with manual operation by cranks for $4,500. (Please note that the air-powered, electronic servo drive option has been discontinued.) See our online store for details and ordering information. The HCEA is continuing to solicit applications for our engineering and construction management scholarships. Click here for more information and an application. Donations continue to stream into the National Construction Equipment Museum! Cleveland Crane & Shovel of Bedford, Ohio, has donated a fully operable 1942 Manitowoc 3500 crawler crane to the Museum. It was built for the U. S. Navy and was derated from 60 to 50 tons. Besides being our first real Crane, as National Director Don Frantz describes it, it is also a very significant historical piece in that it represents the first use of a torque converter in an excavator, a concept that Manitowoc introduced shortly before this example was built. The 3500 was also the basis for the very successful 3900, which used a larger circle, wider crawler base and larger crawlers. Along with the crane, the donor provided transportation, which involved the trucker very impressively snaking an over-length I-beam trailer and jeep dollies around the tight curve off the road and over our bridge. Thanks to Bill Aurelius and Cleveland Crane and Shovel for this tremendous donation! The Museum has received from volunteer Bob Young what may be the oldest pull grader in its collection. Unfortunately, there is no way of positively dating it within reasonable cost, but it’s a Western Wheeled Scraper Standard that is known to have been in production in the early 1910s. It’s complete and in need of restoration. Thanks, Bob! John S. Buckley has donated two more machines, a Hough HA industrial wheel loader of unknown age and a restored, very old Marlow diaphragm pump. Thanks, John, and thanks to National Director Dave Geis for hauling them to the Museum! 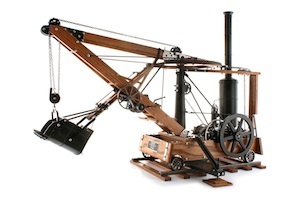 View an updated Museum equipment list, and images of the machines in our collection. Equipment World Magazine, a Media Partner of the HCEA, has launched a web page dedicated to collectors of construction toys and models. it's called Model Mania; have a look at it! Roger Amato has launched a new website devoted to all types of older crawlers and dozers at www.classicdozers.com. The website with a banner picture of two dozers at the 2009 HCEA International Convention and Old Equipment Exposition, contains photo galleries with hundreds of pictures of crawlers, dozers, wheel dozers, and tracked loaders of all American manufacturers. Read more!